As the world warms, extreme weather events are becoming more frequent and intense, sea levels are rising, prolonged droughts are putting pressure on food crops, and many animal and plant species are being driven to extinction. It’s hard to imagine what we as individuals can do to resolve a problem of this scale and severity. 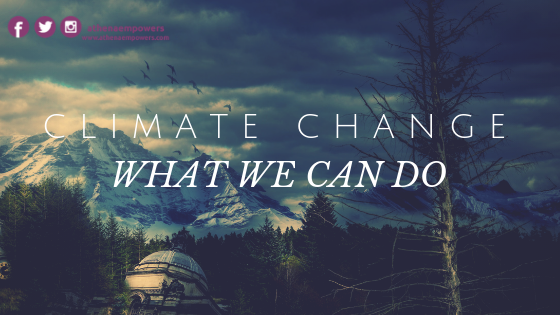 What we can do to minimize the impact of climate change? Switch to an electric or hybrid vehicle. Fly less (if you do fly, make sure you offset your emissions). 2. Use energy wisely — save money, too! Change to energy-efficient light bulbs. Unplug computers, TVs and other electronics when you’re not using them. Wash clothes in cold or warm (not hot) water. Dryers are energy hogs, so hang dry when you can and use dryer only when you can’t. Focusing on life’s simple pleasures — spending time in nature, being with loved ones and/or making a difference to others — provides more purpose, belonging and happiness than buying and consuming. Sharing, making, fixing, upcycling, repurposing and composting are all good places to start. Here are four simple changes you can make to your diet to reduce its climate impact. Buy organic and local whenever possible. A healthy planet and stable climate aren’t political issues. It’s all about families, communities, energy systems and humanity’s future. It’s important to get everyone on board, working toward climate solutions. People are more often influenced by friends than by experts, so make sure to talk about climate change with friends and family. Tell your stories — about changes you’ve seen where you live, how climate change has affected you, and the changes you’re making to lessen your impact. Encourage friends and family to explore what they can do about climate change.